Have you ever looked at a nook or corner in your house and wondered how you could make it useful? Or how could you make it add to the décor of the room in a way that says: “Wow!” to your guests, family and friends? 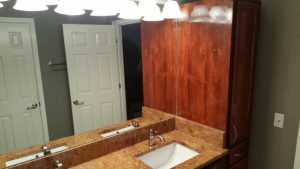 Custom Cabinetry with a creative designer can produce some amazing results. Years back, I had a very nice young lady visit me at the office with an unusual request. Her daughter was nearing her sixth birthday and she wanted to give her something extra special for her birthday. She wanted to transform her daughter’s bedroom into something her daughter would really like. She had researched her ideas on line, and looked at all kinds of theme beds and other ideas; but in the end her search failed to produce anything that really made the statement she was looking for. So we talked about ideas she liked, and those she did not. Then I suggested a trip to her house to meet her daughter, and see her room; along with the space we had to work with. Upon meeting her daughter, it was clear: She played in a fairy tale world with princesses and castles. Therefore I designed a castle bed for her which was rivaled by none. 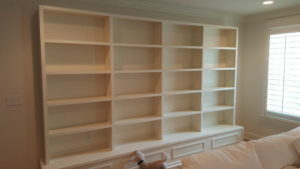 This was a complete bedroom set. Two dressers and a tall bookshelf held up the full size bed. 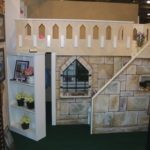 The parapet wall was shaped like a castle top with a smooth edge all around it. The stairs pulled out as drawers, and small book shelf was hinged so it could swing open as a secret passage. The entrance for the dressers under the bed was built on the right of the picture and not shown in this picture. The tall bookshelf on the left went several feet passed the top of the bed acting as a head board and a place to store books, and other items of her choosing. We had a specialist faux painter put the finishing touches on, and we had a hit! Why hire a creative team to design your project? Because Creative people make the difference between average, and Fantastic! Visit your Custom Cabinet Shop and find the designers who bring your ideas and dreams into a beautiful reality! produce anything that really made the statement she was looking for. a castle bed for her which was rivaled by none. on, and we had a hit! dreams into a beautiful reality! When it comes to cabinet construction, this topic at first glance may seem a bit like Batman vs Superman. Who would win? Let’s consider trends: Appliances for example; talk to anybody who sells appliances for a living and they will tell you most appliances built today are built to last about 12 years give or take. How many of us know that grandma still has a 30 year old refrigerator in her basement that shows no sign of dying anytime soon? I would think progress (New) would lead us to a time where we could build things better, stronger, longer lasting, and more dependable. This tends not to be the case; today the engineering is so precise that even bolts are measured to have the minimum strength needed to do the job it was meant for and not much more – cutting corners to save money and boost profits. Our cabinet company recently purchased a newer but used truck to tow a trailer. It is F-250 with a diesel motor and lots of power. We discovered this auto company cut corners by putting in insufficient bolts that hold the engines head in place, and when it is under stress of towing, the bolts literally stretch and cause oil and water to leak in places it doesn’t belong – causing the motor to over heat. If you own one of these models, you know what I am talking about. This was a very expensive fix for us; plus we dare not use the dealership to fix it – because they would use the same prescribed minimum strength parts and we would wind up with the same problem down the road. Which leads to the question is the old way of building things better? Often time’s older things tend to be over engineered. The result of this usually is longer lasting, less repairs and products that stand the test of time. Maybe the question should be: better for whom? Cheaper products are better for share holders, but the consumer loses in the end. So if you are an investor, go for the competition; but if you are a consumer, you may want to consider voting with your dollars and purchasing a product that will last. When competition on price becomes the driving force – the business’s competing are in a race to the bottom to produce the cheapest product that will hold together long enough to leave the shop. Thus the expression: “Tail Light Warranty” When you see the tail lights of the delivery truck, the warranty is over. When shopping for cabinetry, you are looking for creativity, beauty, elegance and a product that will stand the test of time. 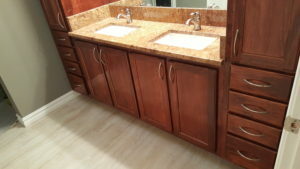 Find a cabinet builder that builds the way they use to build; Find a cabinet shop not willing to compromise product for price; and you will have found something that will last. McDonald’s reportedly sells 75 hamburgers every second. That’s nearly 6 ½ million hamburgers every single day. If each hamburger has 4 pickles on it: they would use approximately 26 million pickle slices every day. A quart jar of sliced pickles has about 240 pickle slices in it. So, if they used quart jars for pickles, they would use about 108,333-quart jars of pickles every single day. If a quart jar of pickle slices was $ 2.00 they would spend about $216,666.00 on pickles every single day. Stay with me: this is fun math. Some marketing genius informed them they could save roughly $ 15 to $ 20 million dollars a year by cutting back from four pickles on each hamburger to only three. This saves them 25% on a whole lot of pickles. We live in a world where every thing we purchase is built with the least amount of cost to achieve the most amount of profit. Do I have to say who loses in this equation? Did the hamburgers get cheaper? No. Did we the consumer see any benefit to this corporate decision? No; but we all paid the price for some marketing genius, and corporate officials to get large bonuses. Let’s leave this thought for a moment and change gears. Regarding cabinetry, how much weight does a hanging rail have to support? Let me first tell you what a hanging rail is. Every upper cabinet is hanging on the wall through screws driven in through the “hanging rail” of the cabinet into the wall where a stud is behind the drywall. These screws are holding the entire weight of the cabinet and the contents of that cabinet. Now think about the weight you stack into your cabinets. Imagine the weight of dinner plates all stacked up, and how many plates one cabinet can hold. Now imagine holding all that and the cabinet to the wall and not falling down. According to the Kitchen Cabinet Manufacturing Association along with American National Standards Institute a typical upper kitchen cabinet should be able to hold 600 pounds. Now that’s a lot of dishes! So, if the hanging rail is screwed to the wall, what holds the hanging rail to the cabinet? The hanging rail has to be mounted in the cabinet in such a way as to be able to distribute all that weight to the cabinet itself. Therefore, the way the hanging rail is engineered into the construction of the cabinet is vital. I stood corrected. You see they engineer them to hold the minimum required weight with the least amount of material possible. Why put in 2 screws on each side of the hanging rail, when most of time 1 will do. Do you see the pickle effect here? Again, who loses? I have personally witnessed two different occasions where photos were provided that showed their upper cabinets literally fell off the wall due to the weight put inside the cabinet. This is unusual to be clear, but someone paid the price for their cabinets falling off the wall. Honestly, that made me reluctant to sell their cabinets. So, when you are looking to have your new cabinets built, remember the pickle effect. 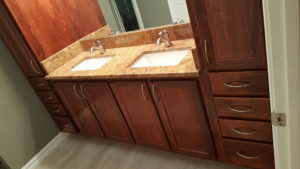 Consider: what is it worth to have custom cabinets built to last – verses prefabricated cabinets built to make a profit. If an ounce of prevention is worth a pound of cure, then certainly a well built custom cabinet is worth it’s weight needed to stay on your wall. 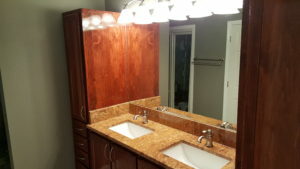 Check out your local custom cabinet shops to see how they construct their cabinets! Again, it’s what’s inside your cabinet that really matters. Have a blessed day. You have heard it said: “life is like a box of chocolates” – you never know what you are going to get. This phrase comes from a novel published in 1987 and later turned into a movie called Forest Gump. Personally, I always thought it would be nice to look into a box of chocolate and know what was inside each piece of chocolate before I made my final selection. How many times do you pick the one that looks the tastiest and it turns out the have the least desirable inside? Wouldn’t it be nice if it were acceptable to put that piece back in its place and take your chances with a different piece? Don’t let anyone catch you doing that. Ha. Once we purchase something, it becomes ours and we might be stuck with it. This can be true in cabinetry as well. Many cabinets look nice from the outside. This is why I tell people always look at what’s on the inside. With cabinetry; unlike chocolates in a box – you can look inside before you make your selection. Last time we talked about drawer glides; today we will be talking about drawer boxes themselves. When you pull out drawers to look inside, look at the construction of the drawer box. In the old days drawer boxes were most often made of solid wood. If they were “home made” they might be plywood. You can tell if they are plywood as the top edges would be several different layers of wood laminated together. The least desirable drawer boxes I have seen are the particle board drawer boxes papered with a substance that is suppose to look like wood, and the edges are most often simply nailed together. These will fall apart at the first sign of trouble. Next look at the way the wood sides are fastened together in the corners. The most stable way to hold the sides of drawers together is with a mortise and tenon joint. Mortise and tenon joinery has been considered one of the strongest joints between two pieces of wood coming together at 90 degrees for thousands of years. Dove tail joinery is a form of mortise and tenon, and it is the most common used in good drawer box construction. These finger like joints between two pieces of wood enable a tight, strong, and long-lasting fit without any nails or screws. Lastly, the bottom is best to be fully captured. This means the bottom of the drawer box is set into a groove cut in each of the four sides of the drawer box. This kind of bottom will not fall out. I have seen drawers only captured on 3 sides for ease of production, which means the fourth side is generally nailed on. This will not be as secure. So, when you are looking for cabinets be sure to look inside to see what you are getting. A drawer box of solid wood – with dovetail joinery and a fully captured bottom is the best way to build a drawer. Remember – Designing your kitchen is not something you do often. So, have fun with it and get yourself someone who can share their expertise to build you the most amazing room in your house. Until next time, God bless. The very first thing I do is to open the drawers. You can tell about the quality of cabinets by the way the drawers function. The drawers shouldn’t feel wobbly, sticky, or loose. They should be smooth, even, and close like they slide. If you are looking at new cabinets, they most likely have European glides. Typically, these are white metal glides with a nylon wheel attached to the drawer box. 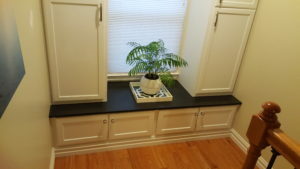 These are inexpensive for the cabinet maker, and cost you in the long run. Many big box line cabinets have upped their quality through purchasing in amazing volumes by putting in soft close under mount glides. These are a nice feature, but most drawers are still too wobbly for my taste. In older homes, many drawers today have those old European drawer glide with nylon wheels that keep the drawer on track. These are cheap and operate just like you would expect. I believe it is the reason for the invention of soft close drawers. After all: Mothers are the necessity of invention. So, some mother got tired of the drawers slamming shut (which sounds like a shelf of glass dishes crashing on the floor) and put her husband to the task. In reality, the soft close was created by Blum. Blum is the industry leader of drawer slides. They were presented the inventors award for design of the original soft close drawer glide in June of 2013 – so in reality what has become the norm, is not really very old at all. 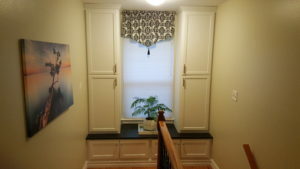 In older homes, there are lots of creative ways people have put glides in. Some have a wooden rail under the middle of the drawer with a single nylon wheel which guides the drawer. These are awful and miraculous at the same time. Awful because they just are; miraculous because it’s a miracle the drawer doesn’t simply fall out. Some drawer glides are literally wood grooves – where the wood from the drawer is gliding on the wood of the cabinet. There is a myriad of ways older drawers work, but it should be fun to see what’s inside and how they work. Regardless of what you find, when it comes time to put in your new cabinets, you will want to use a glide that is made of steel, with ball bearings to keep it steady and smooth for a very long time. Which brings us to Maccabee’s Cabinets: We typically use Blum side mount glides. These are the smoothest strongest glides on the market. I once designed a kitchen for my wife with our grand kids in mind. 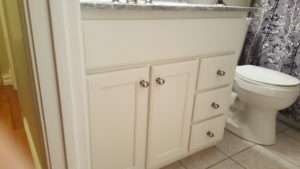 The sink cabinet had drawers under the sink; and I built the drawers with ¾” bottoms and Blum side mount glides which I mounted dead center on the drawers. 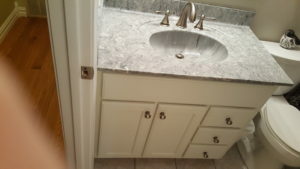 You could pull the drawer out, flip it upside down (assuming it is empty), and put it back in to use it as a step for the kids to reach the sink for washing their hands. These glides are so strong; I could stand on the drawers and not get nervous. 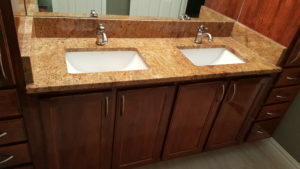 So, when it’s time for you to shop for cabinets; don’t judge a book by the cover… take the time to look inside to see what you are actually getting. Note: if all you have to see is a nice brochure, it’s tough to tell what’s really going into them. Next time we will talk about the drawer boxes themselves.